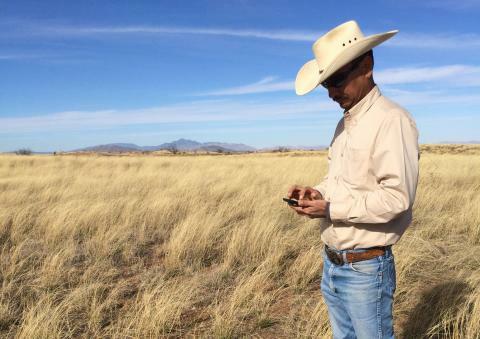 USDA-NRCS rangeland scientist Emilio Carrillo uses an open data mobile app called LandPKS for sustainable land use management. Every day, people around the world use data to make decisions. When heading out of town, most of us use weather apps to check the forecast anywhere in the world before packing our bags. However, when we travel to far-flung places, we may find ourselves packing food from home because we don’t know what may be available when we arrive. We have a global, comprehensive, open data set that enables weather forecasting, but not something similar for food and agriculture? USDA recognizes that farmers, ranchers, and consumers alike – use data daily, from deciding when to plant, harvest or sell their crops, when to turn out cattle to pasture, or where to buy fresh fruits and vegetables. This is why it is important that data be made available, open and accessible, to facilitate the best-informed decisions. Around the world, a movement called the “open data revolution” is under way to make data available for public use. This movement is expected to generate new insights, drive better decision-making, and enable governments, civil society, and the private sector to better target interventions and programs. All of this is why the U.S. Government, led by USDA, was a founding partner of the Global Open Data for Agriculture and Nutrition (GODAN) initiative and why it continues to support the advancement of open data for agriculture and nutrition around the world. Now with over 500 partners, GODAN continues to support the sharing of available, accessible, and usable open data for agriculture and nutrition to help ensure global food security. If we’re going to feed over 9 billion people by 2050, we need open data policies to make decisions based on facts and evidence. This global perspective will help identify data already available and data gaps that exist, and sharpen the focus on how open data can foster innovation and collaborative research, creating whole new kinds of growth around the world. For the first time, USDA’s Rural Housing Service is publicly releasing data across every program area in which the agency provides loans, guarantees, and grants—multifamily housing, single-family housing, and community facilities. This set of data will bring stakeholders and the public unprecedented insights into rural housing program delivery, impacts, challenges, and opportunities across the country. It will be updated regularly, so check back frequently for the latest release. Click here for the data. Mapping applications like PolicyMap are incorporating USDA’s rural housing data and overlaying them with other indicators. To help communities, governments, businesses, and research institutions better understand and plan for the risks of storms, floods, and other climate-change-related impacts, the U.S. Government is enhancing accessibility and releasing today a collection of datasets containing scientific and technical information that may help inform the current and potential future effects of climate change on energy and infrastructure. 1) How are fundamental energy resources impacted by climate? 2) How might changes in climate and natural resource availability impact energy conversion infrastructure and processes? 3) How might climate impact energy transmission and distribution systems? 4) How might energy demands be impacted by climate change, including heating and cooling but also energy losses and energy used for adaptation by other sectors? 5) What capacity do we currently have to adapt energy systems, and how might technology solutions, systems designs, and operational changes improve energy system resilience for climate change? 6) How might climate change impact energy infrastructure and its interactions with networked and interconnected infrastructure systems? This monthly report provides national trade data including imports, exports, and balance of payments for goods and services. Statistics are also reported on a year-to-date basis. Data are continuously compiled and processed. Documents are collected as shipments arrive and depart, and are processed on a flow basis. Provides Seattle Fire Department 911 dispatches updated every 5 minutes. Available in an easy to explore, interactive format. The Transportation Research Board will host a conference September 16-18, 2015 to provide transportation professionals with information about emerging best practices and research results on how to adapt surface transportation networks to the potential impacts of climate change and extreme weather events. The conference will examine efforts to mainstream consideration of climate change and extreme weather resilience in all aspects of the transportation sector, including planning and programming, capital improvements, and operations and maintenance. The Consumer Complaint Database contains data from the complaints received by the Consumer Financial Protection Bureau (CFPB) on financial products and services, including bank accounts, credit cards, credit reporting, debt collection, money transfers, mortgages, student loans, and other types of consumer credit. The database contains over 100,000 anonymized complaints and is refreshed daily. Data available about each complaint includes the name of the provider, type of complaint, date, zip code, and other information. The CFPB does not verify the accuracy of all facts alleged in the complaints, but takes steps to confirm a commercial relationship between the consumer and the identified company exists. One company uses big-data analytics to find grey charges on users’ credit cards and debit cards by drawing upon billing dispute data from the web, banks, and the CFPB’s open consumer complaint database. The Safety community contains product recall data from around the Federal government. It includes recalls related to cars and many different kinds of products – from household products to outdoor, sports, and recreation products to child-related products. SAP Recalls Plus allows consumers to create watch lists or specific product alerts around government created product safety recall lists. We Make it Safer uses government recall history to let users compare products they own to products on safety recall lists. Salary information for all active, permanent employees of Montgomery County, Maryland, as of January 15, 2013. This data will be updated annually. This is presented as an interactive, easy-to-explore dataset. The Third Annual Safety Datapalooza is being held today from 9 AM to 1 PM ET at the U.S. Patent and Trademark Office. The event will be livestreamed at http://livestream.com/uspto/SafetyDatapalooza. From 10:50 – 11:30 AM ET, the Innovation for Disaster Response and Recovery Initiative will be featured during a panel moderated by the White House Office of Science and Technology Policy. Panelists from the National Institutes of Health, U.S. Department of Homeland Security, U.S. Department of Energy, U.S. Geological Survey, and the Data.gov team will discuss recent technology and innovation milestones, #opendata efforts, and opportunities for public engagement. This year’s Safety Datapalooza will provide an overview of ongoing programs as well as new commitments. Senior government representatives will join innovators from private, nonprofit, and academic organizations, sharing examples of projects that have used freely available government data to build products, services, and apps that advance public safety in creative and powerful ways. The event will include new safety data resources in the areas of transportation, food, occupational, and consumer product safety, as well as tools to improve disaster preparedness and emergency response. Follow @SafetyDataGov on Twitter and #SafetyData #DisasterTech for the latest information about the event and ongoing efforts. Strengthening our Nation’s resilience to disasters is a shared responsibility, with all community members contributing their unique skills and perspectives. Whether you’re a data steward who can unlock information and foster a culture of open data, an innovator who can help address disaster preparedness challenges, or a volunteer ready to join the “Innovation for Disasters” movement, we are excited for you to visit the new disasters.data.gov site, launching today. Integrated Postsecondary Education Data System (IPEDs) includes information from every college, university, and technical and vocational institution that participates in the federal student financial aid programs. Datasets include year-over-year enrollments, program completions, graduation rates, faculty and staff, finances, institutional prices, and student financial aid. Alltuition makes college more affordable by matching prospective students with the grants, scholarships, and loans they qualify for based on their demographic data. Simple Tuition uses higher education data to match students with the most affordable college loans and repayment options. Open Badges is an innovative infrastructure that allows colleges and industry organizations to award micro-credentials (badges) to students who demonstrate proficiency in specific competencies. A student may earn a particular competency badge by demonstrating prior experience, or by participating in courses or informal learning experiences. Because the technology behind the badges is open, a learner can collect badges from any number of different organizations and showcase them in one single place. To a federal statistical agency like the U.S. Energy Information Administration (EIA), there’s nothing more satisfying than providing needed information that can facilitate more informed analysis and policy decisions on a national and regional level. 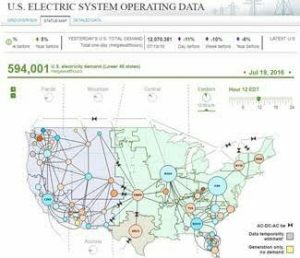 EIA recently launched a new U.S. Electric System Operating Data tool, which provides hourly electricity operating data, including actual and forecast demand, net generation, and the power flowing between electric systems. The tool features nearly real-time demand data, plus analysis and visualizations of hourly, daily, and weekly electricity supply and demand on a national and regional level for all of the 66 electric system balancing authorities that make up the U.S. electric grid. The information is collected directly from each interconnected electric system on the EIA-930 survey, the first hourly data collection conducted by a federal statistical agency. Although electric system balancing authorities covering most of the United States have released voluminous public, nearly real-time information on grid operations since the late 1990s, EIA’s U.S. Electric System Operating Data tool expands the availability of data to the entire contiguous 48 states, and makes it available in a consistent format from a single source. To learn more, watch the U.S. Electric System Operating data tool promotional video, along with a set of four video tutorials. The Energy Information Administration collects statistics on energy generation, distribution and consumption in the United States. Their new APIs provide developers easy access to EIA’s extensive data on electricity, petroleum, natural gas, and more. Open data is helping bring capital to Main Street businesses. For example, one fast-growing lender is combining data from a wide range of government sources to make working capital loans to small businesses. Using open data on industry-level economic trends, the company is able to build finer-tuned predictive models. Another data analytics startup is working with banks to unlock insights about businesses from new government sources. Critical data about businesses are buried in unexpected places. For example, it is possible to estimate the number of employees a given company has based on existing, publicly available data about participants its retirement plan. Check out our extensive data, including the BLS Producer Price Index, Census data on manufacturing and trade inventories and sales, monthly and annual retail trade survey data, the NAICS business data classification system to start innovating to bring capital to America’s small businesses today! The Department of Education’s Office of Federal Student Aid delivers aid to students, including through federal loan, grant, and work-study programs. There is extensive data available related to these programs, including information about over 6,000 individual colleges and postsecondary institutions. For example, there is data available on cohort federal student loan default rates by school, lender, state, and institution type. Got to the Federal Student Aid Data Center. AirAtlas is a series of web maps that show estimated air quality statistics for atmospheric deposition, ozone, and visibility in the contiguous U.S. The maps also show National Park Service (NPS) units and monitoring locations for each of those air pollutant categories. Specific estimates of each statistic are available for every NPS unit in the contiguous U.S.
Everything you ever wanted to know about earthquakes? Yeah, we’ve got that. The USGS Earthquake Hazards program has everything you ever wanted to know about earthquakes and more — from maps to tips to trivia to data in a multitude of formats, serving everyone from your neighbor to your neighborhood scientist. The USGS locates about 50 earthquakes each day and 20,000 a year, and 75 million Americans in 39 states live in places that are at risk of earthquakes. Where do you live? The index tracks change in women’s empowerment that occurs as a direct or indirect result of Feed the Future interventions in targeted geographic zones within the initiative’s 19 focus countries. Data for the WEAI will be collected every two years in all 19 countries, and baselines were collected in 2011 and 2012. USAID and partners will conduct data analyses to understand the relationships among empowerment, livelihoods, and food security, as well as relationships among the various components of the index. The Demographic and Health Surveys (DHS) program has collected, analyzed, and disseminated accurate data on population, health, HIV, and nutrition through more than 300 surveys in over 90 countries. These surveys cover AIDS indicators, gender, malaria indicators, youth, family planning, health facility provisions, benchmarking surveys, key indicators, geographic details, and qualitative interviews. The Job Openings and Labor Turnover Survey (JOLTS) program produces data on job openings, hires, and separations, providing an assessment of the availability of unfilled jobs, and information to help assess the presence or extent of labor shortages in the United States. What are the latest actions by the Environmental Protection Agency (EPA) to enforce environmental laws like the Clean Air Act and the Clean Water Act? The EPA Consent Decree dataset provides updated information on EPA enforcement actions to stop violations of environmental laws. The settlements and consent decrees dataset provides full information about the location of the violation, the company involved, the settlement terms and penalties, and the health and environmental benefits that will result from the enforcement action. List of severe weather alert systems throughout Missouri provided by local governments, media outlets, and other sources. This is an easy-to-explore, interactive dataset. The U.S. Coast Guard maintains an archive of historical vessel position movements, collected through the Nationwide Automatic Identification System (NAIS). Originally designed to improve maritime safety and security, these historical vessel position records have proven to be a valuable resource for a variety of engineers and researchers studying the aquatic world. For example, fishery resource managers with the responsibility of improving multiple sturgeon populations have used historical data from the NAIS to evaluate where fish and vessels might interact. Before sturgeon populations crashed in the late 1800s, harvests along the Atlantic coast were measured in thousands of tons. If sturgeon populations rebound to their historical levels it could mean the renaissance of a commercial and recreational fishery that has been lost for generations. Understanding where sturgeon might be at risk from vessel strikes or propeller cuts is just one small part of a larger conservation and recovery effort around the country. The public can request historical vessel position data through the U.S. Coast Guard Navigation Center (NAVCEN) online portal. To learn more about sturgeon and efforts to rebuild fish stocks visit the NOAA Fisheries website. Vessel track lines, James River, VA Vessel tracks through the James River, Virginia. Processed using the AISAP tool developed by USACE-ERDC. E. J. Hilton, B. Kynard, M. T. Balazik, A. Z. Horodysky, and C. B. Dillman. 2016. Review of the biology, fisheries, and conservation status of the Atlantic Sturgeon, (Acipenser oxyrinchus oxyrinchus Mitchill, 1815). Journal of Applied Ichthyology, 32: 30-66. The U.S. Coast Guard (USCG) is responsible for investigating reportable marine casualties, accidents, and serious marine incidents. The relevant mission statement and specific regulations can be found on the USCG Investigations Division homepage. After an incident has been reported, it is entered into a national database of all marine casualty and pollution incidents. These important historical records can then be accessed by researchers interested in understanding maritime safety, accident prevention, or trends in certain types of maritime incidents through time. 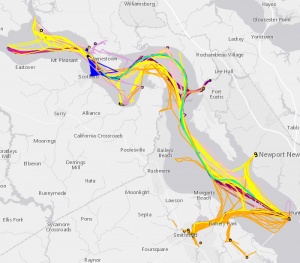 Other agencies interested in maritime transportation performance measures rely on the USCG data to examine incident trends on U.S. waterways. Files for the Marine Casualty and Pollution Data for Researchers datasets can be downloaded directly from the U.S. Coast Guard Homeport website by following the drop-down menu options on the homepage Missions: Investigations: Marine Casualty Pollution Investigations page at https://homeport.uscg.mil/missions/investigations/marine-casualty-pollution-investigations. Visitors to the USCG Homeport data download site should note that there are three files available fore download, but it is the second file on the list (named MISLE_DATA.zip) that contains all available marine casualty data from January 2002 – July 2015. The files extracted from MISLE_DATA.zip can be opened with most standard spreadsheet editing software programs. U.S. Coast Guard closed and open incident investigations, 2002 through 2015 (part year). On July 25, 2017, the Executive Office of the President Office of Management and Budget (OMB) will host a Roundtable on Open Data as a driver for economic growth. Here’s why we’re focusing on this opportunity—and how you can help us. Open data is free, publicly available data that anyone can access and use without restrictions. U.S. Federal Open Data is a strategic national resource. American businesses depend on this government data to optimize their operations, improve their marketing, and develop new products and services. Federal Open Data also helps guide business investment, foster innovation, improve employment opportunities, and spur economic growth. The value of Federal Open Data to the United States has been estimated at hundreds of billions of dollars. The U.S. Department of Commerce calculates that internet publishing, consulting and market research firms use this data to generate more than $200 billion in revenues each year. Other studies have found that U.S. weather, GPS, Census, and health data support billions more in revenue in other sectors. How do companies use government data to build their business? Finance companies use a wide variety of data types to evaluate credit, guide investments, and quantify risks, including the risks of lending to individuals or businesses. Healthcare companies tailor Precision Medicine treatments to individual needs, while others empower patients to find the best care at the best price by using data on hospitals, medical groups, medicines, and patient outcomes. Consumer retailers use GPS and weather data to improve shipping along supply chains. They also use Census data to target their marketing, choose new business locations, and identify consumer trends. Transportation and trade companies use Federal data to make transportation more efficient, improve safety, and facilitate trade. Geospatial companies use open data to build mobile applications, GPS navigation tools, and real-time mapping platforms – all to find population growth trends, reduce road congestion, track flu outbreaks, and improve disaster response. The Roundtable on Open Data for Economic Growth will emphasize how companies create value from and leverage freely available government data. Leaders in government and industry will explore the economic and societal benefits of Open Data for American businesses and entrepreneurs. 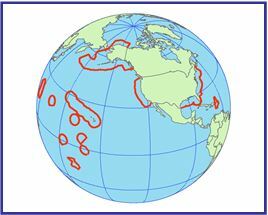 NOAA collects and uses active acoustic (or sonar) data for a variety of mapping requirements. As the national archive for multibeam bathymetric data, NGDC manages over 15 million nautical miles of ship trackline data from sources worldwide. In 2011, NGDC, in partnership with NOAA’s National Marine Fisheries Service (NMFS), initiated a new archive for high resolution data collected with sonars capable of mapping the water column. Water column sonar data are collected on NOAA fishery survey vessels and academic and international fleets, and are used to assess the physical and biological characteristics of the ocean. Primary uses include 3-D mapping of fish schools and other mid-water marine organisms, assessing biological abundance, species identification, and habitat characterization. These data are also useful for evaluating underwater gas seeps, remotely monitoring undersea oil spills, and bathymetry. NGDC is working with scientists at NMFS and the Joint Hydrographic Center to ensure the long-term preservation and world-wide dissemination of these data. NOAA is responsible for depicting on its nautical charts the limits of the 12 nautical mile Territorial Sea, 24 nautical mile Contiguous Zone, and 200 nautical mile Exclusive Economic Zone (EEZ). The outer limit of each of these zones is measured from the U.S. normal baseline, which coincides with the low water line depicted on NOAA charts and includes closing lines across the entrances of legal bays and rivers, consistent with international law. The National Weather Service provides weather, water, and climate data, forecasts and warnings. A National Mosaic view of National Weather Service (NWS)’s radar imagery allows interactivity with the display providing you with the ability to customize the way you “look” at weather. Called RIDGE2 (Radar Integrated Display with Geospatial Elements, version 2), the radar image can be layered with geospatial elements such as topography maps, highways, state/county boundaries, and weather warnings. Outside of this interface, a user can also make use of this radar mosaic image overlay to add to user’s geobrowser of choice. The Weather Channel broadcasts weather forecasts and weather-related news over their cable channel and web properties. Climate Corporation offers weather insurance that helps farmers protect their potential profits against bad weather that can cause yield shortfalls.